Drive - It is approximately a 7-hour drive from Adelaide. 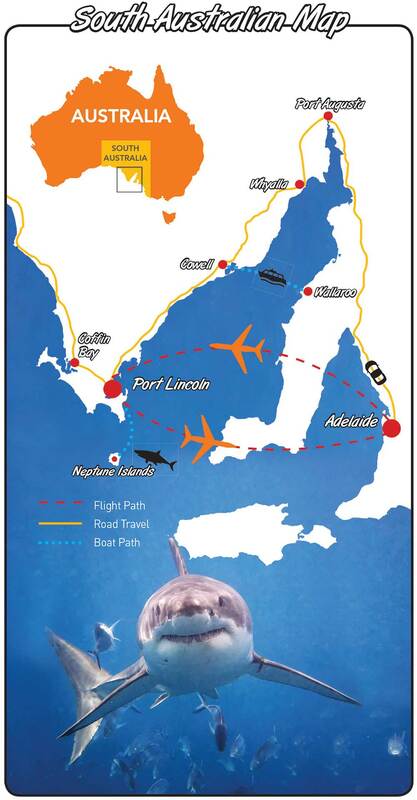 ** Please note - If you are driving make sure you refuel in Whyalla as it is the last option before Port Lincoln. The Cowell Roadhouse is only open until 7pm. Fly - It is a short 40-minute flight from Adelaide Airport. We recommend flying with Regional Express Airlines, which operates multiple flights per day. Calypso Star Charters is privileged to have access to a ‘Corporate Fare’ for guests who dive with us. The Corporate Fare needs to be booked through our office. Valid for last seat availability. The fare is flexible, refundable and name changes are permitted. The Corporate Fare is fully flexible incase the charter is delayed/cancelled due to bad weather. Changes are permitted up to 60 minutes prior to departure. The corporate fare is especially attractive when guests require bookings at short notice or are travelling at peak times, for example weekends. Larger fleet of aircraft, which means there is a better chance of being re-accommodated on an alternative aircraft in the event of a mechanical breakdown or weather delays. Qantaslink also fly to Port Lincoln multiple times a day. Whilst you are here why not stay a few extra days to experience more of what our beautiful region can offer? Click HERE to check out the @port_lincoln Instagram page to give you some inspiration!